Second-year Bulldog Ed Richards is determined to build on his promising debut year for the Club. Richards managed 21 games after being recruited with pick 16 in the 2017 NAB AFL Draft, spending time at both ends of the ground and on a wing. The versatile teenager expects a tough challenge this season, with plenty of competition for spots over the pre-season. “I really enjoyed last year, getting a good hit-out in the AFL and being able to play almost every game, which is not something that most first years do,” Richards told westernbulldogs.com.au. “That’s something I’m pretty proud of, and hopefully will reflect on it as something that kick-started my career. “At this stage though, you forget about it because there’s heaps of competition for spots now, there’s a lot of people on the park and we don’t have as many injuries as last year. Richards said coming back for round two in 2019 had been interesting. 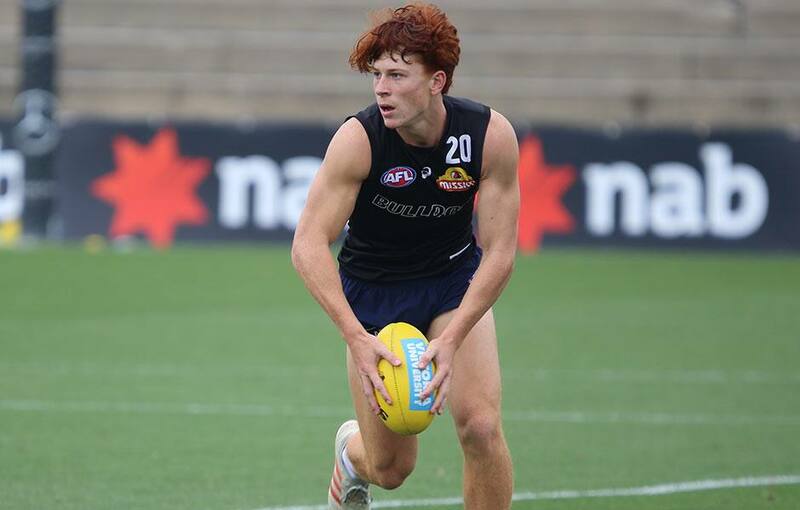 The work-load of pre-season has increased, after being eased into the program somewhat as a draftee, but that was balanced with more familiarity of the Club and the playing group. “It’s a lot harder than my first pre-season, I’d say… it’s been different,” the 19-year-old said. “We’ve had to do a bit more workload, we’ve got through it all and survived it all to this point which has been great. “As a first-year it takes a while to get used to everything, it’s all pretty complicated to start with, managing a schedule and everything to do with that. As for his own role, Richards is committed to being as versatile as he can be. That’s included putting extra time into his forward craft, and spending more time on a wing in pre-season drills. He’s confident that he’s improving – as is the whole group – and that 2019 holds a lot of promise for the Bulldogs. “For me, I am just taking things as they come,” Richards said. “I’ve got little individual goals that I work with the coaches on and things to try to improve my game, but overall it’s mainly about trying to keep good form, and to stay fit and healthy. “Every team strives to play finals, and I think we’re definitely striving to get back to where the Club was in 2016. “The culture around the group and the overall vibe is really good. Like the way he talks. No ceiling for the Ed. He's got a mature head on him. Looking forward to watching him develop this year.